Tomorrow (Tue 4th Oct) marks 100 years since the first moving staircase was demonstrated on the London Underground, at Earl’s Court station to be specific. Not sure if TfL is planning to have a cake or other celebration though. There were in fact two escalators — both supplied by the Otis Elevator Company — and linked the Piccadilly Line platforms with the subway that runs under the subsurface lines (District/Circle). One escalator could only carry passengers upstairs, while the second model which normally took passengers down, could be reversed to upwards if the other unit was out of action. 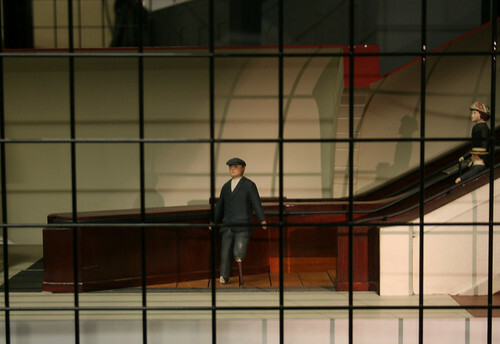 Famously, the railway company hired a one-legged man to ride up and down the escalators on their first day to show how safe these mechanical terrors could be. There is some doubt about the truth of that story, although Annie Mole has been contacted by an alleged relative of the monopole’d chap. Despite the dispute of the veracity of the tale, there is a tiny model of Bumper Harris at the Transport Museum’s Acton Depot (which is open this weekend). According to a Board of Trade report, during the first week, nine dresses were torn, one finger pinched, and a lame passenger had fallen from his crutches – presumably not Bumper Harris. After that, and a guard rail had been added, no more accidents occurred over the next three weeks. The escalators were only licensed for one month by the Board of Trade, who would review them again – and quite evidently decided they were a spiffing idea. The two escalators were so successful that between 1911 and 1915, 22 machines were installed on the London Underground system. Although of note is that the first escalator didn’t have the slats on the steps with a “comb” at the top/bottom as we expect today, but as the flat moving steps reached the upper landing, they disappeared under a “V” shunt. The purpose of the shunt was to literally shove passengers off the stairs and onto the landing. This required them to take an awkward sidestep with one foot while the other foot was still travelling forward – which proved tricky for many passengers. It wasn’t long before the shunt was shunted into history and the comb/slats was introduced. Animals have always had a bit of an issue with escalators, and there has often been jokes made about the poorly worded warning that “dogs must be carried on the escalator“. Either a remarkable coincidence, or deliberate timing, but London Underground has just lifted the ban on Guide Dogs using escalators without being carried. Early escalators were wood and metal, but following the King’s Cross fire, they were all stripped back to metal only, except for one escalator that defiantly clings onto its wooden heritage at Greenford Station. Also, while tomorrow marks the 100th anniversary of the first escalator, earlier this year also marked the 50th anniversary of the travolator at Bank Station. Bumper Harris was my Great Grandad. I would love to get in contact with lost relatives and any I don’t know about! There is a very good researched account of the real story of Bumper Harris in a book in the London Transport Museum. This sets out that Bumper Harris was a tunneling engineer working on the installation of the escalators and paints quite a different story about why he was there and what his role was – basically he was the clerk of works for the escalator installation and was only asked to ride the escalator on the first day because he had an artificial leg. According to the book he was reputed to be the first person to use a pneumatic drill for tunnelling purposes. Its called “Moving People From Street To Platform 100 Years Underground” by Ray Orton and doesn’t seem to be available in this country.